Small-airway narrowing (with or without chronic bronchi­tis) and emphysema caused by smoking are the common conditions resulting in COPD. Chronic bronchitis is daily sputum production for at least three months of two or more consecutive years. Emphysema is a pathological diagnosis, and consists of alveolar dilatation and destruction. Breath­lessness with exertion, chest tightness and wheeze are the results of airway narrowing and impaired gas exchange. The loss of lung elastic tissue in emphysema may result in airway wall collapse during expiration, leading to dynamic hyper­inflation and consequent increased work of breathing. The irreversible component of airflow limitation is the end result of inflammation, fibrosis and remodelling of periph­eral airways. Airflow limitation leads to non-homogeneous ventilation, while alveolar wall destruction and changes in pulmonary vessels reduce the surface area available for gas exchange. In advanced COPD there is a severe mismatching of ventilation and perfusion leading to hypoxaemia. Hypercapnia is a late manifestation and is caused by a reduction in ventilatory drive. Pulmonary hypertension and cor pulmo­nale are also late manifestations, and reflect pulmonary vasoconstriction due to hypoxia in poorly ventilated lung, vasoconstrictor peptides produced by inflammatory cells and vascular remodelling. The clinical features and patho­physiology of COPD can overlap with asthma, as most COPD patients have some reversibility of airflow limitation with bronchodilators. The follow up of a cohort of children aged 10 to 16 initially recruited in 1964 demonstrated that childhood participants who had wheezy bronchitis (n=53) and asthma (n=38) had an increased risk (OR 1.81 and 6.37 respectively) of COPD by mean age of 61, compared to cohort controls (n=239). Multivariate analysis details of adjustment for smoking were not provided (Tagiyeva 2016). A meta-analysis of six prospective cohort studies following children with or without wheezing into adulthood found an association between childhood atopic wheezing and prevalence of COPD in adulthood (RR 5.307, 95% CI 1.033 to 27.271, P=0.046) (Ma 2018). By contrast, some non-smokers with chronic asthma develop irreversible airway narrowing. The overlap between chronic bronchitis, emphysema and asthma and their relationship to airflow limitation and COPD are illustrated in Figure 1. This proportional Venn diagram presents data from the Wellington Respiratory Survey which recruited participants over the age of 50 and invited them to have detailed lung function testing and chest CT scans (Marsh 2008). It can be seen that almost all patients with both chronic bronchitis and emphysema meet the GOLD definition of COPD, as do most with both chronic bronchitis and asthma . Patients with chronic bronchiolitis, bronchiectasis and cystic fibrosis may also present with similar symptoms and partially reversible airflow limitation. The diagram (reproduced from Thorax 2008;63:761-7 with permission from the BMJ Publishing Group and corrected in Thorax 2015;70:905 to now include the clear circle in the middle of the emphysema circle) presents the different phenotypes within the Wellington Respiratory Survey study population. The large black rectangle represents the full study group. The clear circles within each coloured area represent the proportion of patients with COPD (post-bronchodilator forced expiratory volume in 1 s/forced vital capacity (FEV1/FVC) ,0.7). 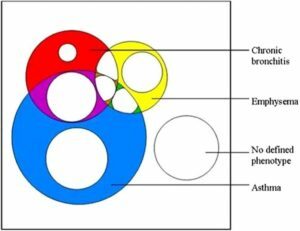 The isolated clear circle represents patients with COPD who did not have an additional defined phenotype of asthma, chronic bronchitis or emphysema. In recent years there has been a focus on the prevalence and implications of the co-existence of asthma and COPD. A systematic review and meta-analysis of 19 studies found that the prevalence of co-existing asthma in patients with COPD was 27% in population based studies and 28% in hospital based studies (Alshabanat 2015). Both this review and systematic reviews by Gibson (Gibson 2015) and Nielsen (Nielsen 2015) found an increased frequency of exacerbations in patients with features of both asthma and COPD compared to those with COPD alone.